Two people married! Twenty-seven years on the 27th! Only on this day, 27 years ago, it was 70 degrees! Not today! I am so incredibly blessed by my wonderful, Godly, sweet and gentle husband. God surely hand-picked him for me! He has taught me so much, in his quiet, gentle way. 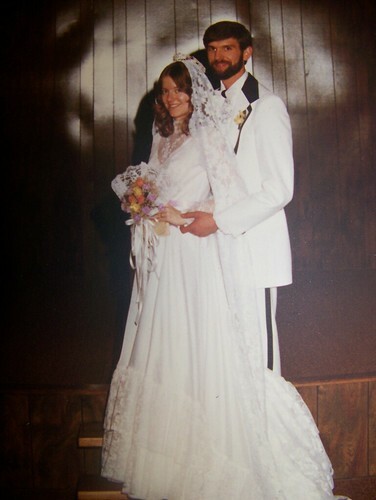 The year we married, my parents celebrated their 25th. We thought, wow! Can you imagine when we do? Well, here we are 2 years beyond that! May we have many, many more wonderful years together!!! This entry was posted on Saturday, February 27th, 2010 at 10:08 pm	and is filed under Family. You can follow any responses to this entry through the RSS 2.0 feed. You can skip to the end and leave a response. Pinging is currently not allowed. So sweet! I love seeing the old pictures! We all change so much through the years! Here's to 27 more years . . . .
Wow. Thats really amazing. BTW, I can see you in your daughters, alot, in that pic. Oh, what a wonderful post! I love the picture!!!!! congratulations, it is our 17th soon. What a beautiful couple! Congratulations on 27 years! May the Lord bless you even more abundantly in the next 27! Oh and your dress is absolutely gorgeous!